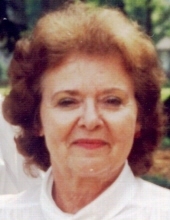 Ruby Jean (Sharp) Ater, age 92, of Clermont, FL, passed on to be with the Lord on Saturday, March 16, 2019. She was born on October 16, 1926 in Fairview, WV to Mildred Irene (Sharp) Pester and John Franklin Sharp. Ruby graduated from Clay Battelle high school in Blacksville, WV where she had been head-cheerleader. Early in life she worked as a photographer’s model and went on to earn a degree from the Pittsburgh Beauty Academy. She later owned and operated beauty shops in New Freeport and Rogersville. Over the years in Greene County she attended the New Freeport Baptist Church, the Willow Grove Baptist Church and the First Church of the Nazarene in Waynesburg. On July 4, 1945, shortly after her high school graduation, she married Bernard Ater with whom she had four children. Ruby and Bernard remained together for over 56 years until his death in 2001. For most of her married life with Bernard she lived in Greene County. They enjoyed RVing and traveled extensively during their retirement years. In 2004 she married her childhood friend Luther Simpson. They lived in Archdale, NC for twelve years and then moved to Clermont, FL where he died in 2017. Ruby is survived by four children: sons William (Joyce) Ater, Jr. of Clarksburg, WV and Shirl (Joan) Ater of Mebane, NC, daughters Brenda (Gary) Corwin of Clermont, FL and Sherry (Bob) Riffle of Fairmont, WV; 18 grandchildren; and 33 great-grandchildren. In addition to her parents and husbands, Ruby was preceded in death by her sisters Helen Dunham of Waynesburg and Naomi Wilson of Ohio. Friends will be received on Thursday, March 21, 2019 from 10:00 a.m. to 1:00 p.m. at Kesterson-Rush Funeral Home, LLC., 3275 W. Roy Furman Hwy., Rogersville, PA 15359. Telephone: 724-499-5181. A funeral service will be held at 1:00 p.m. in the funeral home with Reverend John Poling, officiating. Burial will follow at Rosemont Cemetery, Center Twp., PA. In lieu of flowers, memorial contributions may be made to Lane Purcell Hospice House, 2452 CR 526E Sumterville, FL 33585. To send flowers or a remembrance gift to the family of Ruby Jean (Sharp) Ater, please visit our Tribute Store. "Email Address" would like to share the life celebration of Ruby Jean (Sharp) Ater. Click on the "link" to go to share a favorite memory or leave a condolence message for the family.